As it already been talked about by Corey, breakfast is the fundamental start to your day. Here are two recipes out of Corey’s Always4ward kitchen to make breakfast healthy and doable. Make fitness and wellness a priority in your life. In a small bowl whisk peanut butter and milk together until blended. Place oatmeal, milk/peanut butter mix, vanilla, chia seeds and cinnamon in a bowl, stir, cover and leave in the fridge overnight. 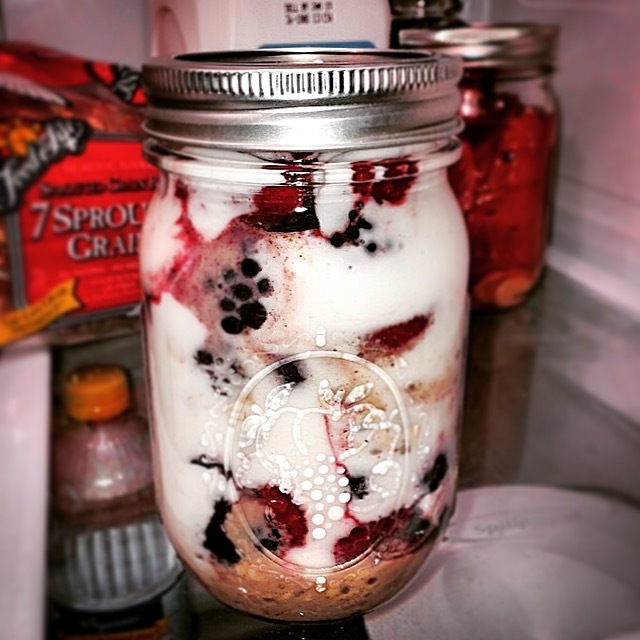 In the morning, layer in this order ¼ cup of yogurt ½ cup of berries oatmeal ¼ cup of yogurt ½ cup of berries. Fruit(s)- 1-2 Cups (fresh or frozen – no added sugar) mix and match in this category! Place about two tablespoons of quinoa in the bottom of each of the four jars, glasses or bowls. Top each with about two tablespoons of berries, two tablespoons of yogurt, half a teaspoon of maple syrup, and half a teaspoon of pecans. Repeat the layers, then top with a couple of berries for garnish, if desired. *All nutritional information is an estimate.